The SARI/EI Phase IV aims is to advance regional energy integration in South Asia, covering eight countries of the region: Afghanistan, Bangladesh, Bhutan, India, the Maldives, Nepal, Pakistan, and Sri Lanka. The program aims to move South Asian countries towards increased regional energy security and focuses on Cross-Border Electricity Trade (CBET) and regional energy market development. 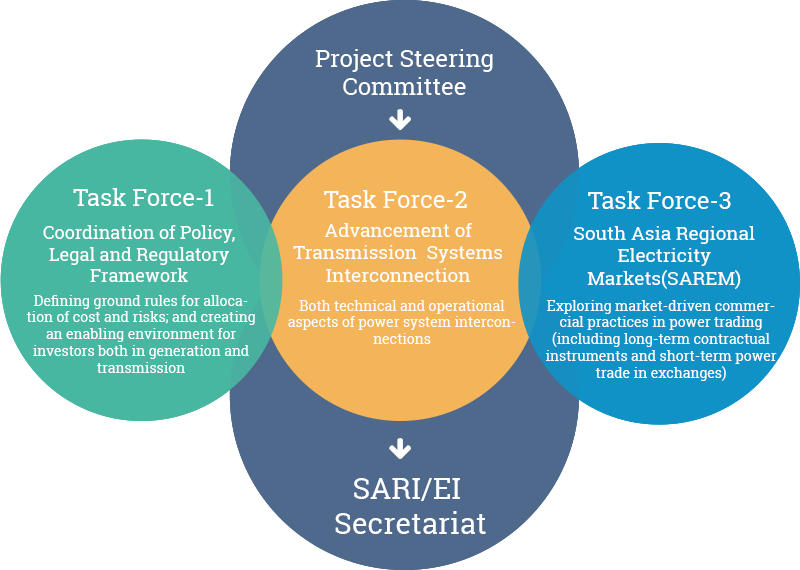 The overarching objective of the SARI/EI program is to develop a common template for technical and commercial aspects of power exchange among the South Asian countries. The program intends to create the right enabling environment to support the establishment of a South Asian electricity market, gain consensus and support from the key decision makers and stakeholders in the South Asia region. Thus the SARI/EI program acts as a catalyst for enabling systemic conditions for regional energy integration. SARI/EI objectives are achieved through the above components across address policy/regulatory, transmission infrastructure and a regional markets for CBET in the region, expedited through highly consultative processes with specific Task Forces. The task forces are guided by a Project Steering Committee (PSC). The SARI/EI Secretariat at IRADe executes the program in consultation with the PSC and the task forces. IRADe, the secretariat to SARI/EI, is pushing the envelope for sustainable energy access in the region through 28 experts and members from South Asian countries. Located in Delhi, IRADe is a nonprofit and fully autonomous institute for advance research. IRADe’s multidisciplinary research and policy analysis aid action programs. It is a hub for a network of diverse stakeholders. Established in 2002, the institute is recognized as an R&D organization by the Department of Scientific and Industrial Research and Ministry of Science and Technology of the Government of India; the Ministry of Urban Development has accorded IRADe the status of center of excellence for urban development and climate change.